Our favorite, the "Classic" fountain, is inspired from an antique original: The Terminus fountain. Terminus was an Absinthe manufacturer during the times of the Belle Epoque and their fountain was decorated with a French rooster on the lid. The classic Absinthe fountain has this legendary decoration as well, as you can see in the picture next to this text. The fountains itself is of highest quality with many intelligent details, that make its use a truely unique experience. If you are looking for an authentic reproduction of an original Absinthe fountain from the 19th century, the Classic Absinthe Fountain should be your choice! Of course, you can also buy pieces completely made out of glass. These fountains have the advantage that they are smaller in size and have that very special "crystal look". They are nevertheless a modern interpretation of fountains, as glass fountains did not exist back in the day. If you directly want to buy your Absinthe fountain, then please visit our Absinthe fountain online shop by clicking on the link or the navigation bar above. What is an Absinthe fountain and which fountain is the best? If you don't know what an Absinthe fountain is, here is a short explanation: Absinthe fountains are the professional accessory to drink Absinthe. You don't necessarily need a fountain, but if you have one, you don't want to miss this unique drinking accessory. In the video below you can see, how you drink Absinthe using an Absinthe fountain. As you see, you don't fill the glass bowl with the Green fairy, you fill it with ice cubes and water. Then, when the water is cooled down, you use it to prepare your glass of Absinthe. Through the spigots water drops drip on the sugar cube on your Absinthe spoon, slowly dissolving it and filling the glass. Be sure that only a tiny beam of water or better only water drops float out of the fountain, because only then the sugar will get completely dissolved. 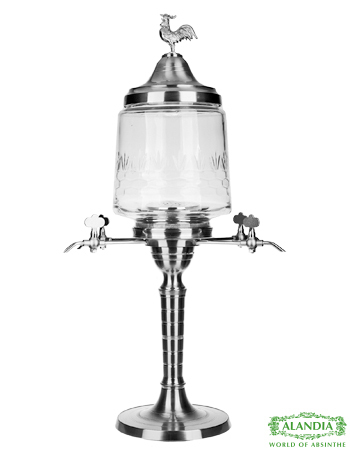 Besides its premium design the special feature of an absinthefountain is, that you will get the nicest louche. The louche is the opalescent effect when the water mixes with the Green Fairy. Green Absinthe turns into an white elixir. You can easily regulate the amount of water that drips into the absintheglass with an Absinthe fountain. This means you can extend the ritual and the slower Absinthe and water mix, the better is the louche effect. > The glass bowl is made from molded glass, which gives the bowl the necessary strength to make it resistant against temperature fluctuations. > Precisely machined thread-mounts guarantee a smooth and easy assembly of the individual components. > The taps are screw-mounted and can be removed for easy cleaning with a pipe cleaner. > The base is cushioned with a foam pad to prevent slippage and scratches on the table. > All of the fountains parts are polished to let it shine like the Belle Epoque itself! The nice thing about this accessory is, that it can look back on a long history. In the beginning of the 20th century, during the times of the Belle Epoque, Fountains or in French "Absinthe Fontaines" were a typical bistro equipment. They were placed at a center spot in the cafe and you could get your your ice cold water out of this water station. 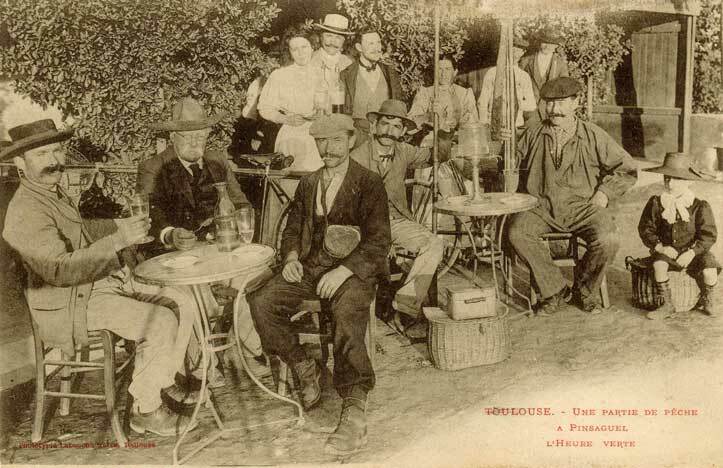 Below you can see an old picture of two Absintheurs enjoying their glass of Absinthe using a fountain. Actually it is the famous Terminus fountain, with the rooster on top of the lid, which guided the design of our classic fountain. Where can I buy an Absinthe fountain? ALANDIA sells all types of authentic Absinthe accessories like spoons, glasses, brouilleurs, sugar, carafes etc. Of course we also sell fountains! We ship worldwide, including the USA, and the delivery is guaranteed, which means if anything happens (e.g. breakage) ALANDIA will reship or refund you our money. But do not worry, the insurance almost never has to be used, we pack very well using professional packaging material. ALANDIA was founded in 2001, therefore we know what we are doing! If you want to read more about ALANDIA and buying Absinthe in the USA, you can visit our info site.